Land Whispering with Dr. Patrick MacManaway — . Join O.N.E. and Dr. Patrick MacManaway in learning more about how you can listen to and take care of Earth within your nature community whether it is your backyard, your park, your garden or farm. There is a sentient intelligence in the spirit of place, in the spirits of the elements and of vibrant nature that we can interact with telepathically. Patrick will share land whispering stories of working with farmers, gardeners and land stewards over the past 25 years on three continents to inspire and invite you to what might be possible where you live. Dr. MacManaway is a third generation practitioner of psychic and healing arts, trained in Western Medicine and the arts of Geomancy and Shamanism. He works with earth energy balancing, and earth acupuncture for geopathic stress remediation, and space clearing for site energy enhancement. 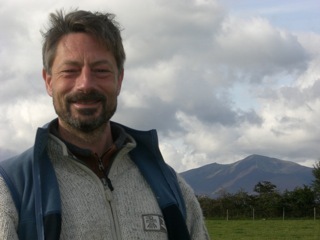 Training first with his parents at their Healing and Teaching Centre in rural Fife, Scotland, Patrick graduated in Medicine at Edinburgh University before taking apprenticeships in both Western and Eastern approaches to traditional Geomancy and working with landscape energy. He is the author of several books and CDs including “The Practical Guide to Dowsing: How to Harness the Earth’s Energies for Health and Healing“, “Cultivating the Light Body” and “Keys To Grace“. For more information about Patrick please visit his website. Past-President of the British Society of Dowsers, he is a Founding Member of Circles for Peace, and design consultant for the Burlington Earth Clock.